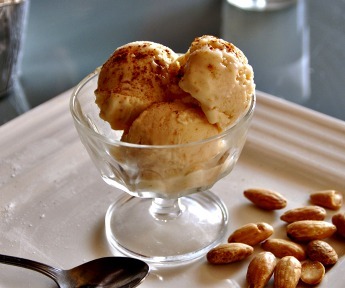 Whether served with ensaimadas or alone, this ice cream makes a perfect dessert. In a blender or food processor, very finely grind the almonds. Use the pulse function and watch carefully. You do not want the nuts to release too much oil, which will turn them into nut butter. In a heavy saucepan, combine the water, sugar, lemon zest, cinnamon stick, and half of the almonds. Place over high heat and bring to a boil, stirring constantly. Decrease the heat to medium and add the rest of the almonds, continuing to stir. As soon as the mixture boils again, remove from the heat and let cool completely. Transfer the cooled mixture to an ice-cream maker and freeze according to the manufacturer's instructions. If you do not have an ice-cream maker, transfer the mixture to a 4-cup container (a glass, stainless-steel, or plastic bowl will do) and place in the freezer for about 1 hour, or until half frozen. During this hour, remove the ice cream from the freezer every 5 to 10 minutes and beat it with a whisk to prevent ice crystals from forming. After the first hour, return the ice cream to the freezer and leave it there for at least 2 hours, or until fully frozen. When made by either method, transfer the finished ice cream to an airtight container and store in the freezer. It will keep for up to 1 week. When ready to serve, remove the ice cream from the freezer about 20 minutes in advance to allow it to soften slightly. Spoon into small dishes to serve.